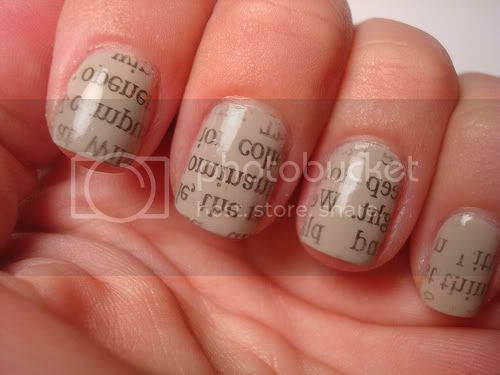 I tried doing this wordy manicure today. It's potentially awesome...but it's going to take me a few more tries to get it right. And to not spend all day on it. I've never been that good at using nail polish (that sounds ridiculous) so YOU might do an awesome job and I'd love to see it. The basic idea is that you paint your nails, use alcohol to transfer ink from paper to your nails, and paint a top coat over all. I used the Crater Lake National Park newsletter (hmm...not printed on actual newsprint, but has fun colors and words). Huge chunks of polish came off when I tried to peel the paper away. I still had one hand ready to go, so I tried the back of a Safeway receipt coupon because the paper was thinnish and it had cool fluorescent pink ink. It still came out kind of chunky with bits of paper, but I'll let it go for the rest of the day (but not care too much about wrecking my nails at the climbing gym later). Yeah. Sorry, no pics of my handiwork until I get it right...and I think I can...someday. I think I needed real newspaper (remind me to pick up a free weekly), or a page out of and old dictionary (you know that thin tissuey paper?). Maybe also some higher quality, newer nail polish. I suspect I did not let the polish dry long enough before applying the paper, and I can't decide if it was better to let the paper dry completely before taking it off, or re-wet it a little bit to ease it off. P.S. Hi! I've been enjoying visitors, music festivals, working, and watching Breaking Bad. That's why I disappeared. It'll probably happen again...the disappearing ♥ Feel free to drop me a note and let me know you miss me, ha ha!